« Congo Tourism. Focus on Lac Ndjale. Dung has a story to tell. The forest primer is printed in patches of dung. Each passing animal leaves its pile, temporary as chalk on a blackboard but as traceable to species as our penmanship is to individual. 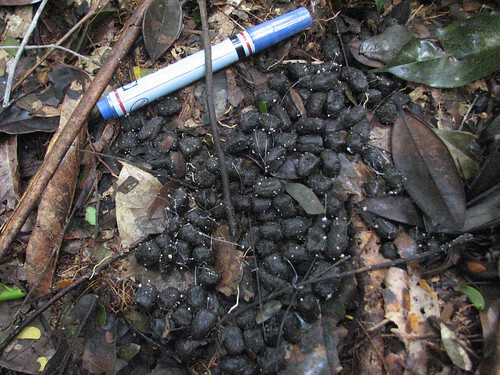 Forest buffalo dung against leaf litter. When an inventory team takes off with notebook and camera for a two week circuit it will be reading the dung-code left on the forest floor. Code for: We are few, or we are many. Code for: This is who we are and this is what we eat (latter only for non-ruminants). Okapi mavi from the north (left) and from the south (right). By their dung we verified that Okapi were in all three provinces in the TL2 focus area. This Okapi dung from Kasai oriental on the west of the Lomami appears to have the same delicate white threads of fungus growing out of it as we find growing on Okapi dung in the far eastern Ituri Forest. 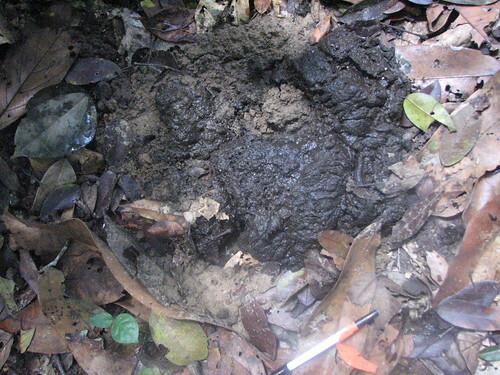 Elephant dung is concentrated in very few blocks of forest leaving most blocks empty. Even without rain, elephant dung disappears quite quickly through the action of beetles and other insects. 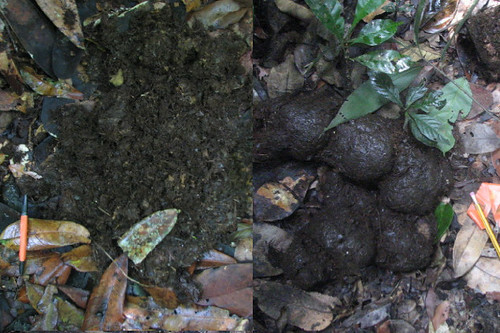 Massive “old” elephant dung on left worked over by beetles, fresh dung on right. Duiker dung is complicated. It is really very pleasing: small, tight, shiny and odorless (at least to our noses). But I am not good at telling the dung of the blue duiker from that of the red duiker or the bay duiker. 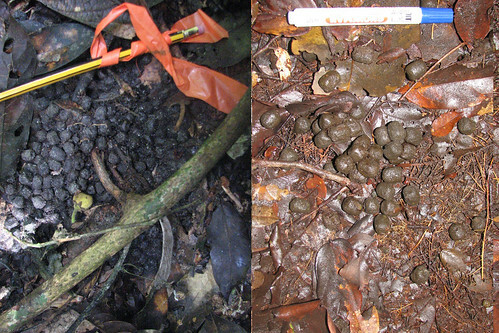 There are slight variations in dung shape and size, but also a certain dung variability within species. So I am stuck. Duiker dung like brilliant dark jewels. The primates are lousy at leaving a record of dung. It’s lost in the treetops. We record primates when we SEE them or HEAR them. Of the primates, it is only the great apes (people and bonobo in TL2) that build shelters. 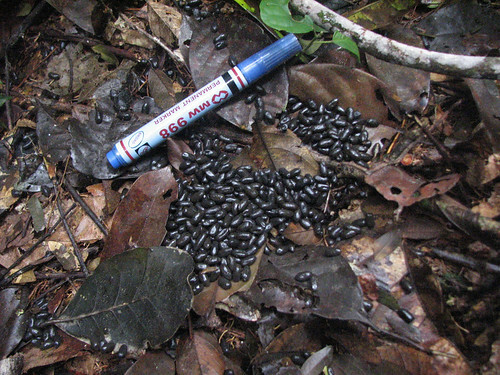 Although there are field specialists in Great Ape dung, nest-counting is our bonobo index…just as abandoned hunting-camps are our record for people. 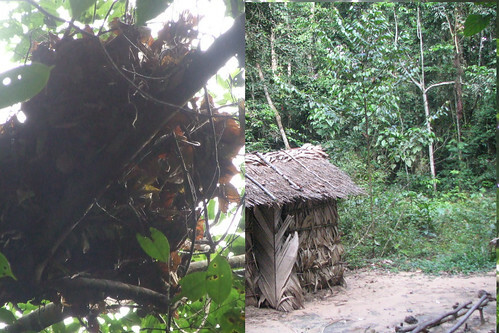 Abandoned great ape shelters: a vegetarian scavenger on left and a carnivorous scavenger on right. After Two Years in the Forests of Central Congo. This entry was written by Terese Hart, posted on 2008-10-11 at 9:28 am, filed under Bonobo, Guides and how to, Okapi. Bookmark the permalink. Follow any comments here with the RSS feed for this post. Post a comment or leave a trackback: Trackback URL. Thank you for the link! I admire the work you do so immensely, and am honored that you’ve seen our little blog! Cleve and I especially like the caption on the last photo!